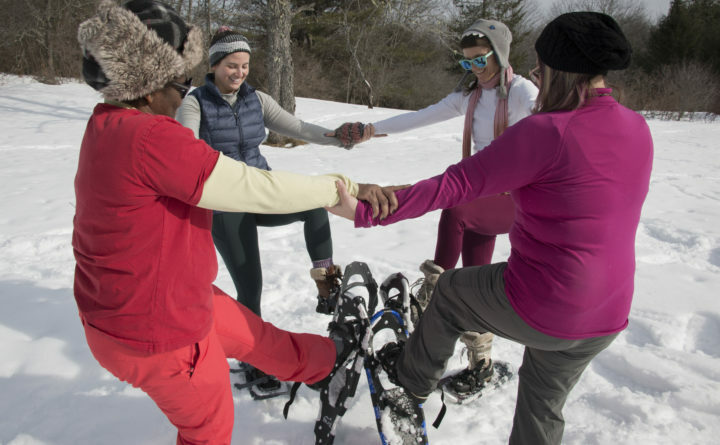 Holly Twining, founder and owner of Maine Yoga Adventures, leads a snowshoe-yoga session, also known as "snoga," on Sunday, Jan. 28, at Hirundo Wildlife Refuge in Alton. Four women emerged from the woods and trudged uphill, the snow crunching under their snowshoes at Hirundo Wildlife Refuge in Alton on Sunday Jan. 28. In the middle of a meadow, they stopped, set down their backpacks and faced the sun. “Take in the sounds. Take in the sights and smells. Take in as much of it as you can,” said the group’s leader Holly Twining, founder and owner of Maine Yoga Adventures. Through the trees came the faint roar of Pushaw Stream as it rushed between icy banks. The sun, breaking through a thin layer of clouds, reflected off the white field, warming the air to the 40s. And all around, tracks of wild animals were stamped into the snow. “Snoga” is yoga in the snow, Twining explained, with some limitations. Wearing a fleece hat designed to look like a shark, a row of pointed teeth marching across her forehead, Twining led her snoga adventure with enthusiasm and positivity that was infectious. Laughter rang through the snowy meadow as she led the women through a series of movements, poses and breathing exercises. Snowshoes can actually help a yogi maintain balance in some poses, Twining said. The three “warrior” poses, for instance, can actually be easier while wearing snowshoes because with both feet are on the ground, snowshoes form a wide, sturdy base. Lift up a foot, however, and the weight of a snowshoe can easily toss you off balance. Or you can try lifting both feet off the ground. “If you want to try a headstand, now is the time,” Twining said in an excited voice. The group watched as Twining got down on her hands and knees, then stuck her head in the snow, then slowly kicked her feet to the sky. She then remained there, moving her legs into different positions with remarkable control, inspiring a few of her clients to give it a try while she spotted them. Prior to living in Maine, Twining worked in New York City as a performer in experimental theater and dance. “I think because I was a dancer, so I love movement, so I think I’m addicted to moving and I want other people to experience the joy of it,” Twining said. After obtaining an interdisciplinary master’s degree focusing on environmental ethics and literature at New York University, Twining moved to Orono and worked for Fields Pond Audubon Center in Holden for nearly 10 years. During that time, she developed an interest in yoga became a certified yoga teacher through the Namaste Institute 200-hour training program. In 2015, Twining founded Maine Yoga Adventures, pursuing her dream to lead adventures that combine yoga with travel, nature, community and new life experiences. She now organizes about two adventures per month. They vary greatly in location, length and cost. Most recently, she just returned from leading 14 people on a yoga retreat in Costa Rica, which also included plenty of biking, snorkeling, ziplining, horseback riding and surfing. And in June, she’s organizing a trip to a cottage in Tuscany, Italy, where participants will practice yoga, take cooking classes and participate in wine tasting events. For the first weekend in February, for instance, Twining has organized a cross-country skiing adventure on the Maine Huts & Trails system in western Maine. And in March, she’s planned a snowshoeing and camping adventure in Baxter State Park with the intentions of ascending Katahdin. Both trips are sold out. 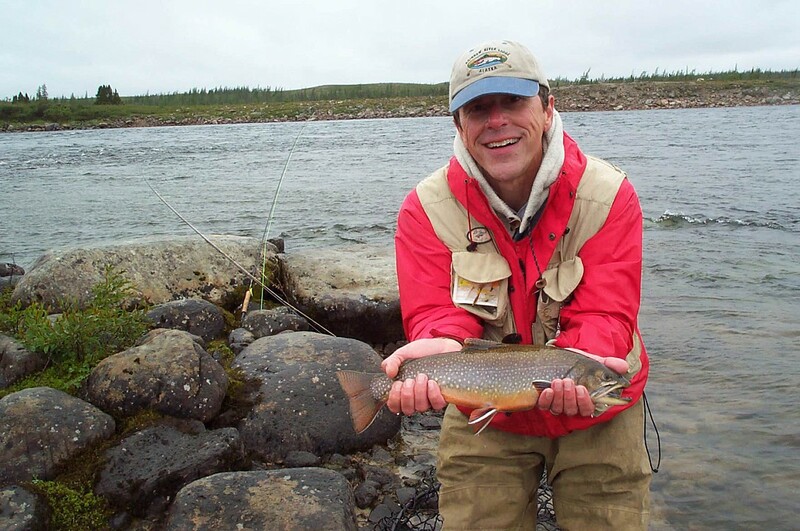 To safely organize the Baxter trip and many others, Twining partners with local guides and businesses to provide additional expertise and resources. For her upcoming “ice climbing, snowshoe and soak” adventure in Acadia National Park scheduled for Feb. 28, she’s teaming up with Acadia Mountain Guides. And the adventure will end with a soak in the hot tub at Atlantic Oceanside Hotel & Event Center. Coventry takes classes at Om Land Yoga in Orono, where Twining works as a yoga instructor, and in December she attended a Maine Yoga Adventures zumba and wine event at the University of Maine in Orono. She also hopes to be able to attend the upcoming Tuscany trip. Coventry and the two other women who attended the snoga adventure on Jan. 28 were complete strangers. They’d all attended the event solo, to get outdoors, enjoy the unusually warm day and explore Hirundo Wildlife Refuge, a place none of them had been to before. And for one of the participants, it was her first time using snowshoes. After the snoga session in the meadow, the group trudged through the woods to Hirundo’s nature center, where they enjoy homemade potato soup, chatted and journaled before calling it a day.